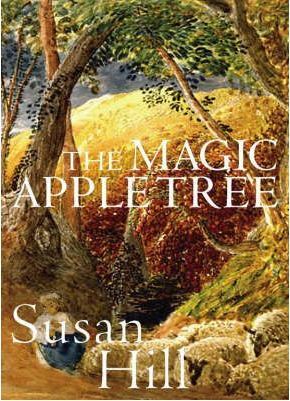 Susan Hill’s The Magic Apple Tree, read for the umpteenth time during a particularly dreary and icy few days recently, set me thinking of a country year we had some years ago, in rural Warwickshire. And rural it truly was. Our rented cottage apparently dated back to early Tudor. T he outside walls thick local stone, golden and totally weather-proof, the roof thatched: little windows peeping out from beneath heavy reed fringes were latticed with old lead work and the inside walls formed from traditional lath overlaid with daub and limewash. The owner, Norman, was a gardener at Ann Hathaway’s Cottage in Stratford-upon-Avon and finding it a bit of a hike into work each day, so he let it to us. The garden, as one might expect, was a mass of flowering shrubs and roses: an ancient apple tree stood in the centre of the lawn while on the other side of the boundary fence, milking cows grazed the days away and ducks swam on a neighbouring muddy pond. Just up the road an old cider mill had been turned into a local craft centre. A village green, Saxon church, village shop and pub completed the picture. Arriving in spring, we had the full benefit of the Vale of Evesham’s magnificent blossom time. The trees so heavy laden their branches, in many cases, touched the ground. Pear, pink cherry, apple and plum as far as the eye could see. And fruit for the picking from the many farms in the area, as long as you were prepared to pick your own. Spring segued into summer when our bedroom window up in the roof opened onto fields of corn gold and lush. One night in August a huge harvest moon hung low, glowing deep saffron over the fields. So close, almost within reach – just a hand-span away. Whenever I hear Sting’s Fields of Gold I think of those magical times and how the seasons cast their individual character and palettes of colour across our small part of England. On fine days I’d walk the two miles along the river bank with our small son who attended the local nursery school. Golden kingcups floated on the quiet water. Mallards and coots busied themselves among the reeds, and plump Hereford steers kicked up their heels against the gad flies biting their rumps. Clumps of gold buttercups sprinkled the fields: we watched calves being born. Two tiny hooves followed by a slightly tilted head, slid to the ground with a bump. Mothers licked the little creatures and guided them gently to their feet. Very soon they were suckling and flicking their tails. And on we went, over the stiles to school. Our stretch of the Avon was popular with narrow boat enthusiasts, some of whom didn’t read their river maps carefully and either catapulted over the weir, with unfortunate results, or teetered on the edge yelling for help, rescue, a rope, something… We came across one such stranding which was actually very funny – from the bank. A large Welsh family were well and truly stuck, right on the brink of the weir, plumb middle of the boat rocking back and forth whenever anyone moved. The plan was to somehow ditch Granny, the tank of water, all the fuel and food, thereby lightening the load sufficiently for the boat to slide gently down the water-fall. At least, that’s what they thought. Granny wasn’t in full agreement with the first part of the plan, and there was a strong warning notice about polluting the river and she, at 99yrs+ had lost the knack of swimming against the tide. We eventually hauled them off with a steel cable attached to a Land Rover and sent them on their way, still arguing at full throttle. Autumn came and went. Fallen leaves crackling with frost under our feet. And the east wind brought the snow. Our little world lay silent,deeply pillowed in white. We walked down to the river one night, crunching pristine snow under our boots. The moon shone silver-cold, snow sparkled and shadows purpled. There was no-one out, just us and a black cat tiptoeing along the bank, leaving tiny paw marks as it moved. We built snow-men, rode trays down the hill and tobogganed for hours, down to the now frozen Avon. It was very cold. But – here in the Overberg, we have many fields of gold. It’s called Canola and is one of the most beautiful sights in spring when a whole valley turns brilliant yellow, the sun shines and the cold winds of winter move to another part of the world. It’s a good place to be! This entry was posted in Jacqueline Dowling and tagged canola, overberg, stratford-upon-avon, vale of evesham. Thanks for the Field of Gold image Sue – looks very familiar, like just over the mountain behind us. Which means Spring’s probably not far away. I do love those fields of yellow … sorry, Gold. It’s one of my all-time favourites Susan. I was happy to read that her husband, Stanley Wells, is now chief honcho of The Shakespeare Trust. He used to come in for evening meals when I was doing my infamous gap year! Also one of my favourite people at the time. Thanks for your comments.